While training for a road ultra, increase or decease pace to pass between key zones. After warming up, run at marathon pace (~82-87% of maximum heart rate) for 20 minutes, then increase speed to half-marathon or tempo pace (~85-93% of maximum heart rate) for 20 minutes, and return to marathon pace for 20 minutes before cooling down. When preparing for a trail event, vary efforts on hills and/or rough surfaces to facilitate the transition between zones. After a warm-up, proceed onto a hilly route. Run an uphill lasting 60 to 90 seconds at 5k effort (~94-100% of maximum heart rate), recover with a slow two-minute jog, and then proceed into an uphill half-marathon effort lasting 3 to 5 minutes. Complete 4 to 6 sets. Avoid injury and burnout. Combining two or more independent workouts in their entirety is a no-no. Use roughly 50% of each workout’s quality volume when shaping the total bulk of a two-workout mash-up. For example, an athlete comfortable with completing 6-mile tempo runs one day and 8-10 hard hill repeats on another would construct a gear-changing workout consisting of a 3-mile tempo run followed by 4 to 5 hill repeats. Similarly, use a third of each workout when combining three workouts. An athlete preparing for Chuckanut 50k should strive to imitate the course’s flat Interurban Trail and climb of Chuckanut Mountain, including Little Chinscraper. A comparable gear-changing workout might look like this: After warming up, do a flat 2-mile tempo run, recover by jogging for 3 minutes, and then run 4 to 6 times a 1- to 3-minute hill at between 5k and half-marathon effort depending on its slope and length. Jog back down the hill as recovery. After the final hill repeat, recover for 3 minutes and finish with the same 2-mile tempo run and cool down. Countless workout combinations, tailored to fit an athlete’s current ability level and needs, can be crafted. Take a page from these coaches’ notebooks and adapt your own intensity-altering workouts for any ultra or trail race. Long run with surges – During the long run, 30-second to 10- to 12-minute hard efforts are peppered throughout the run. The length of the surge dictates the effort expenditure. Fast-finish long runs – At the end of an easy long run, begin pushing the pace in the final 4 to 8 miles and then ’empty the tank’ in the final 10 minutes. Mario Fraoli, the head coach at Ekiden Coaching, challenges his runners with this type of gear-changing tempo run. During a 20-60-minute tempo run, throw in a 30-second to one-minute 5k to 10k-effort ‘burst’ every 5 to 10 minutes. Brad Hudson, the director and head coach of Hudson Elite, an Olympic-development running group, uses ‘threshold repeats‘ several times during a training cycle to build confidence and fitness. Start with 2 x 1.5-mile progression runs with a 3-minute recovery jog between the 1.5-mile repeats. Begin with the first half-mile at half-marathon effort, the second half-mile at 10k effort, and finish with a half-mile at 5k effort. Finish this workout with 8 x 200 meters at a fast but controlled effort. 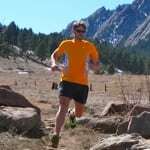 Modify this workout for undulating or technical trails by running by time instead of distance: 2 x (4 minutes at half-marathon effort, 3 minutes at 10k effort, or 2 minutes at 5k effort, for example) with a 3-minute jog between sets followed by 8 x 20-25 seconds at a hard (but not all-out) effort. ZAP Fitness Team USA Training Center’s elite athlete coordinator and coach, Peter Rea, tests athletes with the ‘Half-Time Fartlek.’ Run a descending ladder in 60-second increments beginning with 6 minutes and ending at 1 minute. Jog easily between each hard portion for half of the repeat’s time. For example, you’d recover for 3 minutes after the 6-minute surge and 2.5 minutes after the 5-minute repeat and so on. Start at marathon effort for the longest repeat. Work down to half-marathon effort for the 5 and 4-minute segments, 10k effort at 3 minutes, and finally 5k effort for the 2- and 1-minute bursts. My favorite confidence-building gear-changing workout incorporates a tempo run and hill repeats. It allows the athlete to learn firsthand that they have one more gear by forcing them to do some explosive running after a tough tempo run. ‘More Power To Ya!‘ starts with a 3-5-mile (20-40 minutes) tempo run followed by 6 to 8 repeats of a 60-90-second hill at 5k effort. Training at one speed does very little to make you race ready, but by occasionally revving your engine during training, you’ll find it easier to cover ground faster when you need and want to. In what gears/at what speeds do you think you run most efficiently and comfortably? What of your gears do you think are the least developed? Can you break one of your upcoming races down into the various gears you will need to get through it? I honestly thought by the title of this article that I was going to need to buy all new running gear because of a new workout you were going to tell me to start doing. I, too, thought the article was about changing gear as opposed to changing gears, which was odd since Ian doesn’t typically write about running gear. Glad I read it, as it’s a good article and I definitely agree with the philosophy. Thanks for the feedback on the article title. I’ve updated it in hopes of making it clearer.